This foundation is a basset hound named Ol' Reliable. It's porridge on a cold September morning (sorry Paleo). It's one of those metallic blankets handed to you by the fire brigade. There's a picture of it in the dictionary next to the word 'dependable' and I put it there. For the past few years, my skin has had it's highs and lows (as chronicled in my post about dermatitis), and throughout my quest for decent skin the Sam to my Frodo has always been Estée Lauder Double Wear. Originally, this foundation was 'The Big Guns', whipped out for uni nights out when sheer-finish tinted moisturisers would just not cut the mustard. Have you ever seen a smokey eye look good when paired with beaming red acne? No. 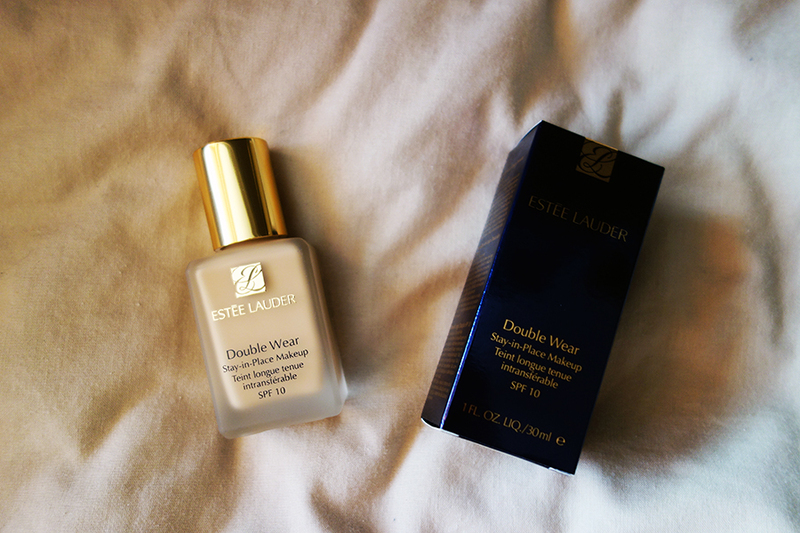 Double Wear saves the day. I'll be honest, I have toyed with other foundations. This ties itself hand in hand with YSL's Touche Éclat foundation as a favourite, I will admit. However, that foundation is dependant on a lot of factors. Oily skin day? Useless. Bumpy skin? Redness? Don't bother. Luminous skin may be a pump away, but only if you have good skin to start with. It's the friend you have to dress up for to meet and you can't eat grains near her because she's cutting them out and she'll notice if your nails are chipped and her legs are longer than you so she walks too fast. All forgivable, often inconvenient. Double Wear just does not care. Dry Skin? Breakout? It's practically a call to arms. At one period of exceptional dryness I nearly had to surrender. This foundation, when not used sparingly, can be like concrete on your face. Teamed with dry patches that begged to be clung to, it's not ideal. Then what happened? I'll tell you what, Tanya Burr happened. In an age old Kim Kardashian Makeup Tutorial she spoke a few choice words of wisdom. "You have to apply moisturiser right before using it". It's so obvious, I'm so stupid and don't deserve nice things. Tanya used the Chanel Hydra Beauty Gel Crème, but I've found that a pea-sized amount of the Origins 'Drink Up' Overnight Treatment Mask does a masterful job of priming the skin (I imagine Embryolisse would do a similar job, if Boots ever restocks it on their website). Double Wear's one flaw, unflawed. Even if your skin isn't dry, massage in a drop of moisturiser or an illuminating primer and you have the world's most long wearing dewy finished foundation in the world (usually, it's a masterful velvet matte finish). If you have a long day at the office, and I mean long, this is the one for you. It's only when I was boxing up my life's possessions the other day (hi mice, thanks) that I rediscovered an old bottle of Double Wear in 'stone' that I stole from my sister (hi Soph, know you love a shoutout) and remembered all the good times. Good old Estée. My shade of Estée Lauder Double Wear Foundation is 'Sand', YSL Touche Éclat Foundation is 'BD40' & Nars Sheer Glow Foundation is 'Fiji'.